A nice addition to my earlier post about Hawaiian Volcano Green, I recently had the opportunity to sample this Hawaii-grown oolong thanks to The Canton Tea Company’s Canton Tea Club. The dry leaves are fragrant, sweet and floral. Unlike the tight twists of many classic oolongs, this one is wild – with loose, exuberant leaves – and even the occasional stem. 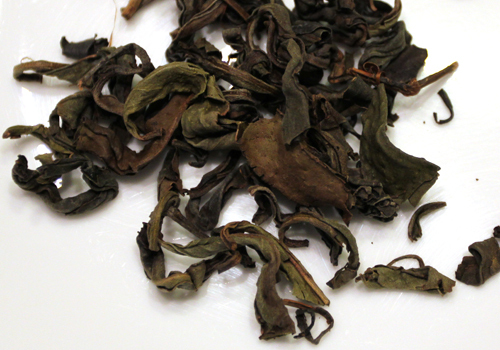 The tips are browned and toasted, promising a darker brew than a lightly oxidized oolong. Steeped at 4 minutes, the tea liquor is a clear, deep gold and smells toasted and slightly fruity. The floralness to the tea, promised by the dry leaves, isn’t present – which isn’t a detractor – but a little bit of a surprise. The steeped cup is medium bodied and light, with a slight hint of sweetness. The flavor of the tea holds up well through several subsequent steepings, and mellows out into a satisfying cup. Overall a wonderful and interesting tea to try.